Great for a crowd, a buffet, a cold winter night, whatever. Use your imagination, left over smoked or grilled meats work great as a substitution; lamb shanks? brisket? chicken?...sky is the limit and the smoky flavor imparted by the Primo makes it even better. Sauté the garlic and the rosemary in the olive oil, and once the garlic has turned blond-brown add the pork. Brown everything, then stir in the Marsala and the wine and cook over a lively flame until they have evaporated. At this point stir in the tomatoes, a cup of hot water (I used chicken broth), and the olives, and season to taste with salt and pepper. Lower the flame to a simmer and cook for an hour and a half**, by which time the sauce should be fairly thick. **I did the prep on the stove in a large sauce pan. When it got to the simmer stage, I transferred it to my cast iron Dutch oven and put on my Primo grill at 250°, sitting on a couple of fire bricks (indirect), for two hours, stirring every 20-30 minutes until thick. Serve with a tossed salad, nice Italian bread, and a light, zesty red wine or beer/s. This would also be great served in bread bowls. This was absolutely the best stew/soup I've ever done on the grill, by far. One more note:some people get squeamish over the black olives. Get over it!! They stay chewable and take on the flavor of the stew. curious how this benefits from being cooked on a grill? seems tailor-made for the stove-top (or oven)! OK so I made this for dinner last night. Really great taste. I made a few modifications to the posted recipe here is the rundown of successes/things I would do different next time. The main alteration to the posted recipe was starting by sweating chunky cut onion, carrot and celery in olive oil, butter and pork fat. Once these were sweat I added the garlic and rosemary and sauteed for a few more minutes. Then I removed and reserved the veggies and browned the pork (I used a package of assorted pork chops and cut them up because they were the best deal) Another change I made was dredging the pork pieces in flour w/a but of brown sugar and herbs before browning. The I reserved the meat and deglazed with the Marsala. The I put the mirepoix and the meat back in the pan and added the red wine. 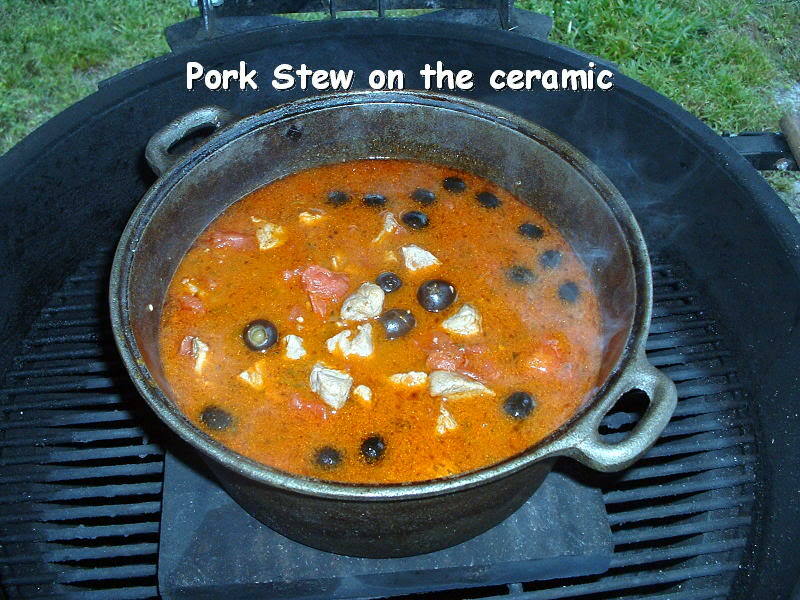 Once reduced I added the tomatoes and olives (I sliced the olives) I also added a dash of liquid smoke (because I was not using a grill) I brought the whole thing to a simmer on the stovetop and then placed in a 350 oven for an hour and a half leaving uncovered for the last 45min. Served in bowls toped with grated reggiano with some thick cut lightly toasted multigrain bread. I think the veggies were a good add. I used slightly less pork. I think this added texture and flavor and made the dish a bit more healthful. I would have liked to use shallots or cipollini onions but the prices were insane $5 for 2 shallots? I could also see mushrooms having a place in this dish adding some earthyness. I did the whole thing in a raw CI dutch oven. I think I would change this.. the tomatoes did some damage to my seasoning... this is probably because the do was not very well seasoned having just been redone and not used alot (I used my 'camping' DO because I was afraid to hurt the beautiful seasoning on my good one) I think in the future I would used enamled CI insetad to avoid the issue even though it would probably require a good scrubbing when done. I forgot to add the final cup of liquid but it did not seem to matter but if I had thought ahead I would have made stock from the removed pork bones... I have them saved for this purpose anyway. A great tasty recipe I dont think could possibly be ruined. The marsala wine is absolutley necessary though.